The idea for a society focused on cancer relief was born in 1982. Mary Dolding and Maureen Stansfield, together with an army padre first had the idea of a palliative care service and the possibility of opening a hospice. Lady Williams, wife of the then Governor, lent her support and asked a Naval Padre, Simon Stevens to undertake a survey on her behalf. There were stumbling blocks along the way, as with every new endeavour, with the first meeting concluding that the proposed scheme was not viable. Undaunted, Lady Williams arranged another meeting, this time with Dame Cicely Saunders, the founder of the hospice movement in the UK. A representative, Dr Fisher, came to Gibraltar to advise on how to proceed, which resulted in the setting up of the first Cancer Relief committee, headed by Lady Williams as President and supported by various religious, business and community members. The priorities of this committee were (1) community care (2) lending of equipment, (3) education and the possible addition of a day care centre. It was also decided to send a State Registered Nurse for training. Gibraltar Society for Cancer Relief (GSCR) was registered under the Friendly Societies ordinance as charity number 38. 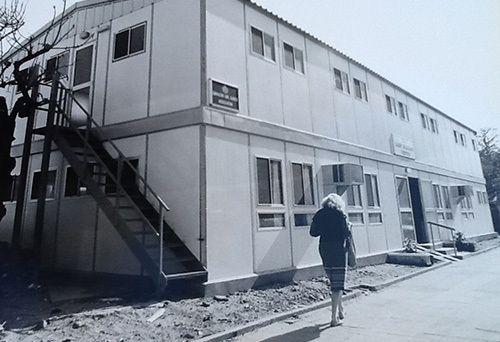 The original day care centre was set up in 1984 thanks to the TGWU offering the society a room in Transport House. From there the Centre graduated to the Lady Williams Cancer Support Centre, Devil’s Tower Road. It ran a successful and supportive day centre for 28 years until it was decided that the society had outgrown its premises. In 2011, the Society was gifted a beautiful colonial building by the government on the south side of Gibraltar. The building allowed for expansion of services to include a more comprehensive modern day care centre with provision of a larger number of specifically tailored clinics and therapies. The Society decided, following a local survey, that along with the fresh new building and enhanced services, a change of name was required to that which we are now as known today – The Cancer Relief Centre. Today the Cancer Relief Centre facility has provided care for over 200 people since opening its doors in April 2013. We have achieved so much since the early dreams of 1982 through the dedication and support of the local community, without whom we would not exist. We still have, however, much more we hope to achieve in our work supporting those affected by cancer. We launched our new hospice @ home service in November 2014 and are actively working towards opening a four-bed hospice on the top floor of our building, a first for Gibraltar.